Jungle trekking around Kampung Kiau in the foothills of the majestic Mount Kinabalu is not for the faint hearted! This trek will take you through dense forest, pineapple fields, steep mountainsides and finally to the lookout point where, on a sunny day, you’ll be greeted with a panoramic view of Mount Kinabalu. This overnight trip departing from Kota Kinabalu city is a great alternative or add on to a traditional trip to Mount Kinabalu and offers you the chance to immerse yourself in local ethnic Dusun culture whilst testing yourself physically in the jungles of Borneo. Those that dare to venture off the beaten path will be rewarded with spectacular views (weather dependent! ), beautiful jungle surroundings and maybe even a chance to sample one of the freshly grown pineapples in the village or see the locals tapping rubber trees in their traditional method. 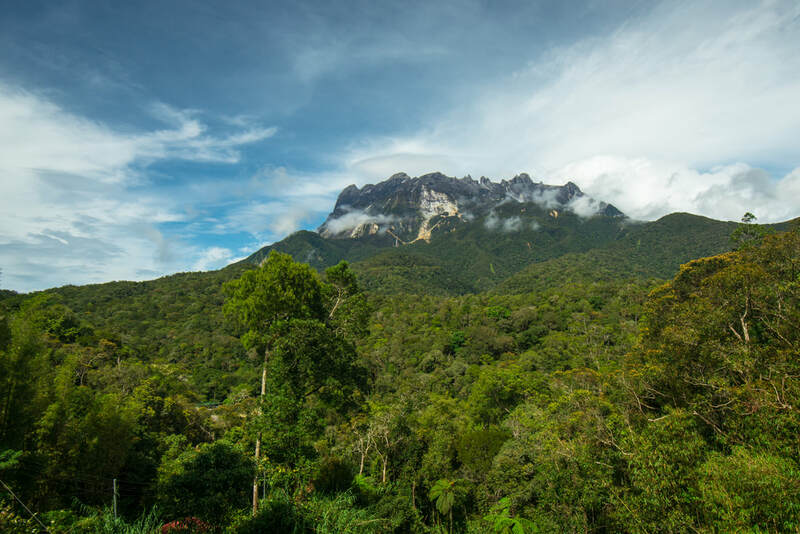 Pick up around 6.30am from your accommodation in Kota Kinabalu to begin the scenic drive to Kiau Village in the foothills of Mount Kinabalu, if the weather is on your side you will be able to enjoy a great view of Mount Kinabalu! Once you arrive in Kiau Village you will meet your local guide and begin the two hour long hike to the summit of Nuluh Lingion (other hikes are available within the National Park upon request with at least 3 days notice). Along the way, you’ll walk through local farms where you can spot (and taste!) fresh pineapple, jackfruit, wild ginger, bananas and much more. You will then continue your hike through trails of primary forest up to the scenic lookout point. Enjoy your packed lunch and a well deserved rest at the summit of Nuluh Lingion (1420 meters). Weather permitting, you’ll have panoramic views of Mount Kinabalu and it's waterfalls! After lunch, you’ll have your pick of four routes to descend back to the Kiau Village. All options include steep descents, traversing rivers, and at times, closely following your guide as you forge your way through the jungle. Sometime in the early afternoon, depending on your chosen route, you will arrive back at Kiau village for a chance to sample the local Dusun food at one of the homestays, at this time you will also meet your host family and check into your accommodation for the night. Following an early rise, as is the village way, and a leisurely breakfast with your host family, you are then free to explore the area for the morning and make the most of the typically good morning weather. At around 10am you will meet your driver for your transfer back to Kota Kinabalu. Includes: Transfers ex-Kota Kinabalu, meals, accommodation in local homestay, entrance fees and English speaking guide (local to the village). Recommended to bring: Water bottle, insect repellent, hat, walking shoes with good grip (Adidas Kampung are best), long socks for leech protection & raincoat.